Whatever Happened to Pudding Pops by Gail Fashingbauer Cooper and Brian Cooper. Wonderful. Nostalgic. Love.These people are really qualified to write about stuff we loved in the 70s and 80s because they remember that delicious ice film on the outside of the pudding pops. Tasty! Literally, they don't make 'em like they used to. Peace Like a River by Leif Enger. One of the best books I've ever read. I recommend. Bossypants by Tina Fey. How great is Tina Fey? Pretty great, friends. The Busy Mom's Guide to a Happy Organized Home by Kathy Peel. Kathy is so helpful. Sometimes she makes me feel ashamed, but she has great ideas that work. I also read almost all of Little Bee. It's very good. I just wasn't in the mood. Poor Little Bee--can't keep my attention. There's no accounting for taste, little bee. I also watched two really interesting documentaries on HBO, which we have now, which is a mixed blessing. 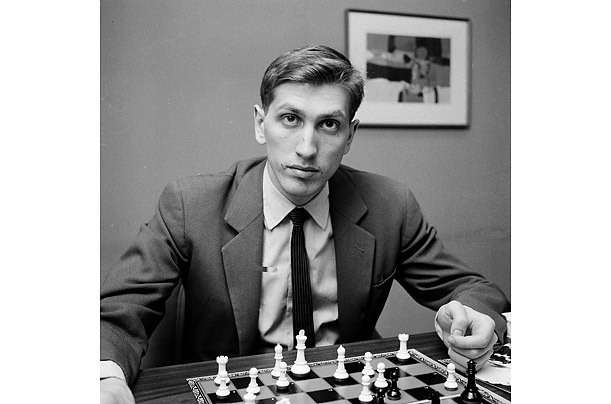 The first one was about Bobby Fischer. Remember the chess boom? Neither do I. It's a pretty sad story, really. But also pretty cool to play the Russian champion and beat him! It's even better than Rocky beating Ivan Drago because it actually happened in real life. And it was way before Rocky IV. It was back when Rocky was just a fat special-needs guy with an ugly special-needs girlfriend. (I can say that because I had a Rocky poster.) Young Bobby Fischer looks like Prince William. 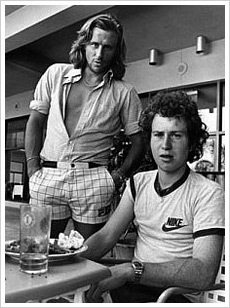 I do remember the tennis boom, which made McEnroe/Borg: Fire and Ice so fun to watch. Tennis is the only sport I've ever actually enjoyed watching. 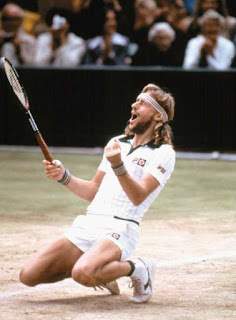 I think we were all into it when Bjorn Borg was around. 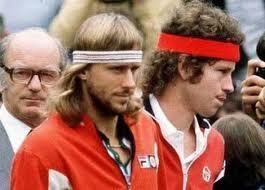 I'm actually a big John McEnroe fan and their rivalry was so sweet. Wooden rackets! Terry cloth headbands! I just love it so much. I loved 1980s tennis and I love these guys. I loved this show. 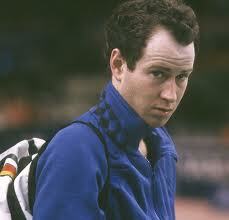 John McEnroe looks like Prince Harry. "Peace Like a River" is one of the most beautiful word feasts I've ever enjoyed. It's also just a fabulous story. So glad you enjoyed it! I'm partial to Chef Boyardee ravioli myself. 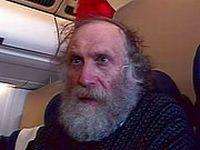 That picture of old Bobby Fischer makes him look like old Robert Duvall in "Get Low". Have you seen that? You'd like it. Actually, who he really looks like is the old man in "Home Alone" who shovels the sidewalks. Thanks for the book recommendations. I'm going to look into these, even though it takes me months to read any book, ever. Speaking of special needs, I'm a slow weaderw. You can't hide your pretension behind Chef Boyardee. He would hate that. I always look forward to your book recommendations. I only wish I remembered them when I went to the library! I am going to tell you a shameful secret: I always hated pudding pops. I thought they were a rip-off. If I want chocolate, I'll eat some chocolate. If I want a popsicle, I'll eat an actual popsicle (my personal favorite: Big Stick, remember those?). The pudding pop and the fudgsicle were just a poor combination. But I never told my mom any of this and just ate the dumb fudgsicles when she bought them. Maybe I realized I couldn't be a critic when I was 9 and clearly wasn't BUYING the fudgsicles. Also I think I misspelled fudgsicle about a dozen times. My top two reads of last month were the bio of Betsy Ross and "My name is Mary Sutter" about a midwife who wants to become a surgeon during the Civil War. It was appalling. Not the book, just her account of the war. Seriously. Pudding pops were awesome and then they were gone. Where did they go? I might read that book if I can find out. The trick was to run them under a little water before eating them--that way you got rid of the film. I LOVE documentaries and NPR too. And Spaghettios (may not know how to spell it) and cheese hotdogs for that matter. Little Bee, yea I read that a couple months ago. It was good, but I didn't love it and it is a total downer. Boosypants, bought it in hardback. THAT is how much I love Tina Fey. I think I may have a problem. Just found your blog by random luck. Fun to browse! I didn't like Little Bee, I couldn't finish it either....oh well. I loved Bossypants. Am I the only one who "lized" it while reading. I sure hope not. John MacEnroe sat behind me at the 1984 Olympic women's gymnastic finals. I got his autograph for all the ladies around me, cuz I was too young to be nervous he'd yell. Mary Lou Retton sweated on both john and me as she vaulted her way to a perfect ten and Wheaties box fame. Kindled Bossypants the day it came out. I wish Tina would write a new book every week. Loved Peace, and and also liked his other book, So Brave, Young and Handsome, but not quite as much. If you are looking for more more beautifully written novels from middle America, get by Marillyne Robinson. Get Gilead. This is what happens when I type on my iPad. I also liked Peace Like A River - but I only remember that I really liked it - I guess I could re-read it - but if I re-read all the great books that I've forgotten, I'd never get to read any new books. Maybe I need to take notes. I have been doing Grandma Duty for 3 weeks, so I haven't been reading all the blogs so regularly, but I always enjoy "catching up" on yours!! Totally have to agree on Peace Like a River. It's a bone-deep love.